Welcome to the 5th Edition of the Carnival of College Admission. As promised, and in commemoration of the America’s Holiday, we offer the “Turkey Edition.” Today you’ll learn all sorts of fun facts about turkeys that you can share with your friends around the dinner table tomorrow. So not only will you have the opportunity to gorge yourselves on the best of the college admissions blogosphere, but you’ll cram your cranium full of tidbits on America’s almost-national-bird: the Turkey. Brad J. Ward, who is himself a glutton for social media in higher education, dares us to “GORGE yourselves on Social Media. Dig In. 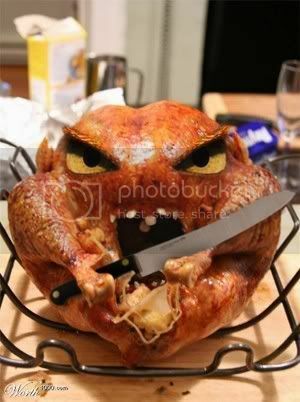 I know you’re hungry.” His post from his blog at SquaredPeg.com asserts that social media is NOT what you think. Gregg Cohen of Campus Bound presents Why It’s Important to Look Beyond the Rankings posted at More Thoughts on College Rankings. In 2007, the average American ate 17.5 pounds of turkey. Not all at once. Over the course of the year. I love looking at students’ Facebook pages, don’t you? I especially enjoy the ones who have a 2.7 GPA, whose mothers assure me they are “good kids” who are toking up and passing around the Jack Daniels. TJ Hanson points out that Your Personal Online Brand – It Begins with your Facebook Profile in his post from the The Digital Student Blog. Todd Johnson, an independent college counselor, explains Why Hiring a College Admissions Counselor in Difficult Economic Times Makes Sense over at his blog, College Admissions Counseling. Transfer students are growing in numbers, but schools often give them the shaft when it comes to providing a satisfying, complete college experience. This post by Jessica Dye of Unigo pushed several readers’ buttons, apparently. Check out Survey Shows Things are Tougher for Transfers posted at theprereq.com. Elizabeth Kudner presents Recession 101: College Applications and Shallow Bank Accounts posted at myUsearch blog. In this post, Brady Norvall gives some great advice about how to change your college application and finance strategy in this tumultuous economic time. In the same vein, yours truly is happy to present 10 Tips for College Planning in Tough Economic Times at my blog, Great College Advice. In 2007, 271,685,000 turkeys were produced in the United States–almost one per person. Jen Himottu, a student at Worcester Polytechnic Institute, asks and answers the question, How do you pay for college?…Scholarships! posted at True Life: I’m a WPI senior…. O. Daille Nation-Ashley, a parent who is mastering the ins and outs of financial aid, shares her understanding of What does Need-Blind Mean , from at her blog, CEOmum – Parenting is a Full Time Job. 97% of Americans surveyed by the National Turkey Federation eat turkey at Thanksgiving. Questions to ponder: What does the other 3% eat. And why? How do you plan for both retirement AND paying for college, As Eric notes on his blog, this is the area most families are not prepared for, and the two go hand-in-hand. Check out Eric’s post, entitled Paying for College and Planning for Retirement – A Double Edged Sword? over at Retirement. Turkeys’ heads change colors when they become excited. 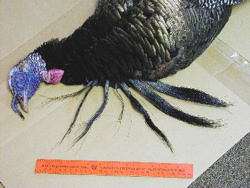 Turkeys can also see in color–so all that technicolor excitement is not in vain. Be thankful for all the free money out there just waiting for you to claim it. Danny Wong gives advice on How to Finance Your College Education over at the myCollegeSTAT Blog. While you may not be able to convince Uncle Sam to entirely forgive and forget your accumulated debt, he might be able to help you find some ways to reduce some of those financial woes. With this goal in mind, Khan presents Student Loan Forgiveness posted at Higher Education and Career Blog. The average weight of a turkey purchased at Thanksgiving is 15 pounds. A 15 pound turkey usually has about 70 percent white meat and 30 percent dark meat. Peter Baron, principal at AdmissionsQuest, offers his Thoughts on the Opening of the Boarding School Financial Aid Season posted at onBoarding Schools. The heaviest turkey ever raised was 86 pounds, about the size of a large dog. Woof! Elizabeth King shares some quick thoughts for juniors as they begin to consider the standardized tests they’ll need to take over the coming months in her post, Juniors: Get Moving! over at elizabeth king’s smart blog. Char presents Using Humor at Exam Time: With guest blogger Dan Brantly posted at PSI Tutor: Academic Mentor. Now, who couldn’t use some chuckles just before the SAT? PicktheBrain presents 10 Ways to E-Boost Your Brain posted at Ace Online Schools. Wild turkeys can fly for short distances up to 55 miles per hour, and can run 20 miles per hour. Commercially raised turkeys cannot fly (nor can they run very fast). Jessica Daniels, the Doyenne of Blogging at Tufts University’s Fletcher School of Law and Diplomacy, serves up “Pass the Application: It’s Under the Pie,” over at her blog at Fletcher School Admissions. Sarah Schupp runs an information service for parents, publishing guides to colleges and the surrounding communities for parents. She offers parents some advice in this post: Home for the Holidays: Surviving your College Student’s Stay | University Parent Media posted at University Parent Connection. Barbara Nixon, a university instructor, offers tips on How to Study for Final Exams posted at Making Connections. Jim presents 40 Money Tips for College Students posted at Blueprint for Financial Prosperity. Joanne presents Tips For A College Student Buying A Laptop posted at Best College Laptops. Turkeys have been bred to have white feathers. White feathers have no spots under the skin when plucked. Most turkey feathers are composted. Larry York presents Are College Kids All Spoiled Nowadays? posted at Dorm Earning. Tom turkeys have beards. These are black, hairlike feathers on their breast. Hens sometimes have beards, too. Speaking of missing the point, Gina LaGuardia presents Unpaid Internships: What’s the Point? posted at College – U. Got It?. Can you guess what the point really is? In 1970, 50 per cent of all turkey consumed was during the holidays, now just 29 per cent of all turkey consumed is during the holidays as more turkey is eaten year-round. Hazing of underclassmen is a global phenomenon, it seems. In India, they call it ragging, however. Jayanta Deka tell us about it in the post RAGGING – JUST A HICCUP!!! posted at an odyssey…. If you enjoy your current college living arrangements, be thankful. Danny Wong presents Roommates: Friend or Foe? How many is too many? Co-ed? posted at myCollegeSTAT Blog. Tom Williams presents “DePaul Quad” – A Social Network for PARENTS! posted at InnoGage. This post is a very cool recap of a session from the AMA Symposium on the Marketing of Higher Education. DePaul, a leader in higher education marketing, created a social network for Parents! Check it out. Dereck proves that it’s never too late to tie up loose ends and achieve your goals. This post, entitled This is the Greatest Week of My Life posted at I Will Not Die. Male turkeys are called toms, females are called hens, and babies are called poults. A large group of turkeys is called a flock. AndrewB presents Simple Steps To Deliver A Dazzling Presentation | Personal Hack posted at Personal Hack. Alvaro Fernandez presents a review of a great book with compelling collection of tales about the amazing abilities of the brain to rewire, readjust and relearn. His post is called Neuroplasticity and the Brain That Changes Itself , and you’ll find it posted at SharpBrains: Your Window into the Brain Fitness Revolution. Want to go on a turkey shoot? Brad likes to procrastinate, and he’s willing to share his passion for this turkey of a time-waster, post on his blog Brad Laughs. Jessica Dye of Unigo presents a cool post about a “college stereotype” campaign from ESPN that stirred a lot of Internet ire. The excerpted memo is hilarious, and it gives some insight into how companies try to appeal to college students (and how quickly it can backfire!). ESPN Nixes College Stereotypes Ad Campaign posted at theprereq.com. Will “No Child Left Behind” actually help – or hurt future university degree program students? College Degrees believes that theproblem with “No Child Left Behind” is that it leaves every student in every classroom in the United States at risk of being left behind. Check out the article Will “No Child Left Behind” Hurt Future University Students? posted at Degree Talk Blog. In a similar vein, Daniel Willingham from the Britannica Blog presents Education: Test From a Curriculum, Not a List of Standards | Britannica Blog . Daniel is not a big fan of NCLB, either, because states are gaming the system by lowering standards and by cutting time in science, social studies, music, and art, so as to spend more time on reading and math. Well, thanks for joining us for this special holiday version of the Carnival of College Admission. The next edition will be hosted by Dawn Papandrea of the College Bound Network, and will go live on December 10th. So get your submissions in early by posting to our handy dandy form . For those who would like to have a look at past editions, visit our Carnival Homepage and Archives. Thanks to all our participants, and please continue to spread the word! Our community is expanding, and already we’re beginning to rotate hosts. With your help, ours will become one of the most useful and successful blog carnivals on the blogosphere! You’ve done it again. You’ve found so many great blogs that I’ve never even heard of. Well done! So glad to see the growth continue! Nicely done, Mark. I’m looking forward to getting acquainted with all my new Carnival friends for the next edition. Sorry I didn’t make it in this edition, but it’s great stuff as always! I’ll be back for next time around. Hi, and thanks for your question. Since your question takes us into a more personal realm, I think it’s best if you try to contact me again via my contact form, and explain your ideas and desires there. I will then get back to you right away. The more detail you provide, the better. Thanks again for your visit, and let me know how I can help!